Diabetes Aloe Vera Juice Benefits! The Benefits Of Using Aloe Vera To Beat Diabetes! What are the benefits of using aloe vera for diabetics? How far can lower blood sugar?What the scientific research reveal on this effect? Where may I find aloe vera? The very first thing that comes to my mind when talking about aloe vera is to repair any scar or help my skin rejuvenate However, this help has been shown beneficial in diabetes too. As for any other herb , the role of aloe vera in improving the glucose levels is determined from its components. Actually, they are five phytosterols (lophenol, 24-methyl-lophenol, 24-ethyl-lophenol, cycloartanol, and 24-methylene-cycloartanol) with anti-hyperglycemic properties inside the aloe. What is more, aloe vera is rich in vitamins and minerals, which diabetics need to face their problem and to boost the immune system. What do clinical trials say on diabetes aloe vera benefits? Below I will try to reveal other clinical trials conducted in humans to see the effectiveness of Aloe Vera. In a study conducted in Bangkok, 36 patients were given one tablespoon of 80% Aloe Vera juice twice a day for 42 days. Another 36 patients of the control group received similarly flavored caminative mixture. As a conclusion, blood sugar levels in the treatment group were significantly decreased to 43 % to the initial values without any adverse reactions (weight gain, appetite changes). In another long-lasting trial, Aloe Vera was effective to lower blood sugar levels in diabetic patients, who were given parboiled Aloe Vera leaves (120 grams twice a day). 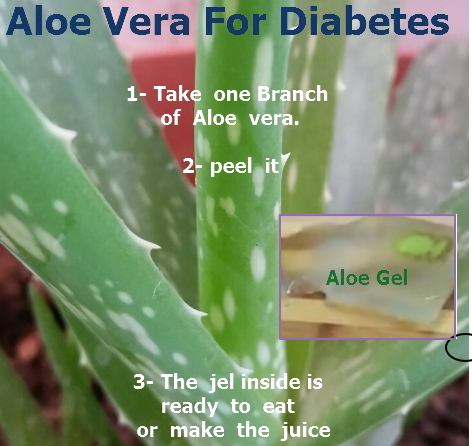 Aloe Vera as all other herbs for diabetes, cannot work alone. A change to dietary strategy and lifestyle habits in the right route, is needed to have more successful results. I am sure you can totally succeed with a strong willing and “fighting-spirit”. Think positively. This can help to make the right choices and have further success. Where can I find Aloe Vera and how to use it? Basically, it is cultivated in Southern Europe, North Africa, USA, and some Asian countries. You may use it as a juice during lunch time or dinner. Or perhaps you may use a supplement containing Aloe Vera gel. Bunyapraphatsara N., et al. Antidiabetic activity of Aloe vera L. juice II. Clinical trial in diabetes mellitus patients in combination with glibenclamide. Phytomedicine. 1996;3,(3):245-248.